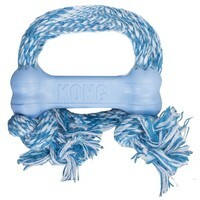 Kong Puppy Goodie Bone with Rope (Extra Small) is a fantastic chew toy that your puppy will adore when teething. Made from specially formulated teething rubber, this toy helps to promote the development of your puppy's teeth and good chewing behaviour. This excellent toy features an added rope for different textures and a wider option of fun games to play. Also it can be used as an extremely effective way to soothe gums by soaking it in water and then freezing.